Dyson Ball Animal 2 Vs. Dyson Total Clean Upright Vacuum (Differences): These two powerful vacuums from Dyson both provide the suction and powered brushroll to clean carpets of dust, dirt and pet hair. Both models have the same specs (270 airwatts suction) which is the highest suction power of any Dyson Upright. Both are not lightweight vacuums, but heavy duty, high powered cleaning machines. Both vacuums are made to tackle dirt, dust and pet hair. 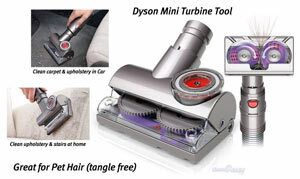 Both models come with a unique Tangle-Free Pet Tool, which is great for removing pet hair. Both upright vacuums use ball technology for easy steering around obstacles. The Animal 2 is purple in color, while the Total Clean is blue. The main difference is the Total Clean comes with Extra Cleaning Tools and a tool bag for cleaning all areas of the home. The Bottom Line: Both vacuums are very capable on all floor types. Both have the power to tackle pet hair, dust and dirt. These models are virtually identical. The Animal 2 is purple in color, while the Total Clean is blue. The Total Clean has the edge with the Extra Cleaning Tools that attach to the wand and hose. A nice storage bag is provided to store all of these tools. Both vacuums are ideal for removing pet hair, as they have Dyson’s strongest suction, a capable brushroll, and other tools to remove pet hair. Both machines have whole machine HEPA filtration, so you won’t be breathing in dust or allergens. 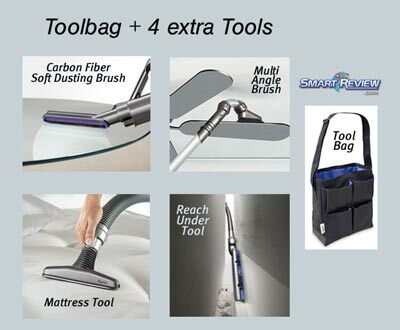 Total Clean Extra Tools: Carbon Fiber Soft Dusting Brush, Multi-Angle Brush, Mattress Tool, Reach Under Tool, and an accessory Tool Bag. What makes Dyson Unique- Main Differences: Dyson invented the cyclonic bagless vacuum, and has been an innovator in the bagless vacuum category. Dyson is also known for strong, powerful, suction. One area that Dyson stands out is its tools. One in particular is the Tangle-Free Pet Tubine Tool, which we believe is the best air driven tool for pet hair on the market. We have seen this tool demonstrated, and it can pick up long hair and even shoelaces without wrapping around the brushes. This accessory comes standard comes with Dyson Animal Corded Vacuums. Dyson invented Ball™ technology, that lets the vacuums ride on a ball to easily maneuver around obstacles.